Before visiting Honolulu, this travel guide will make you know much better about this city's best restaurants, attractions, shopping districts and more. Welcome to the “Peace of Shelter”, or Honolulu, if to call it by its widely known name. Your business trip to Honolulu guarantees to be one of the most exotic journeys you’ll ever experience. The warmth of the city is going to infuse your soul and you will look for ways not to go back home. It is a great destination to turn your business trip into a bizcation and enjoy this one of a kind culture that becomes even more charming with the city’s warm blooded people. Honolulu, the capital of Hawaii is the most populous city in the state. The estimated population of the city is around 380.000 people, living in 5 different districts of Honolulu. These 5 districts are Downtown, Waikiki, Manoa-Makiki, Eastern Honolulu and Western Honolulu. The different features and characteristics of these five create the unique Honolulu atmosphere when blended into each other. Honolulu is going to welcome you with its embracing weather no matter which time of the year you visit the city. The weather in the city shows the typical characteristics of the tropical climate; the temperature is between 27-32 the highest and 19-24 degrees the lowest. While the upper parts of the city may face unexpected showers, it is usually sunny in the city center and the beach areas. 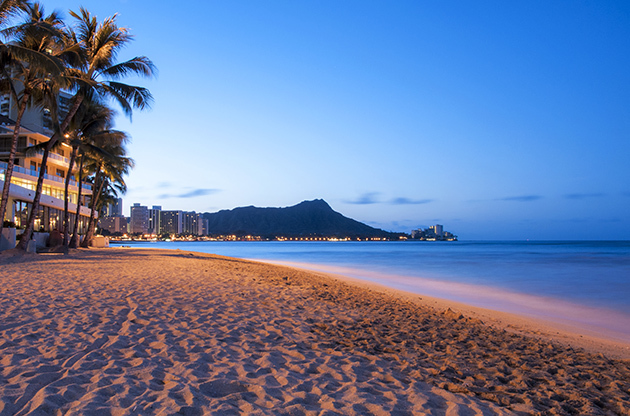 Get ready for one of the most distinguished travel experiences you will ever have in Honolulu. Indulge yourself with the most exquisite dishes from the Hawaiian cuisine and let the attractions in the city feed your hunger for cultural and historical intellectuality. Make sure to have some extra space in your luggage for the authentic shopping experience in Honolulu. This city will leave the marks of sunshine both on your face and your heart so that you can always remember it with a warm smile. How to get to Honolulu? Honolulu International Airport is located 5km from the city’s business district and it is the main hub of transportation since it serves a large number of airlines both for flights between Hawaiian cities and United States’ mainland. If you don’t want to rent a car for yourself or pre-arrange a car to pick you up from the airport, you can use Airport Waikiki Express that will take you to downtown Honolulu. Of course, it is always possible to rent a car or hire a cab once you are outside of the airport. In Honolulu, local transportation is based on buses. There is neither a subway nor a tram, so if you would like to explore the city by using public transportation, you can make use of the official website of TheBus that gives detailed information about the routes and schedules. Taxis are the other means of transportation in the city. If you want to rent a car while you are there, it may be wise to consider the rush hours; 8AM to 9:30 and 5PM to 6:30. You can explore Honolulu after your meetings or even between them however you may not take enough of it. There a bunch of places to visit, a large number of local dishes to taste, fancy night clubs to enjoy, authentic shopping to make a exciting excursions to choose from in Honolulu. Don’t forget your swimsuit when you are going to Honolulu because no matter how busy your schedule will be, you are going to enjoy a swim in Honolulu’s white sandy beaches at least once. Waikiki Beach is of course the most well-known of the many beaches in the city and this is the reason why it is also the most crowded one. If you want to visit a calmer place, then you can try Ala Moana Park, a nice beach that walks hand in hand with the most beautiful shades of green. If you want to know more of the Hawaiian history, then you should pay a visit to Bishop Museum that is home to a large number of Hawaiian artifacts. Iolani Palace, Mission Houses Museum, Honolulu Academy of Arts and Contemporary Museum are the other places that you may want to check out to dig the cultural heritage of the city. Pearl Harbor is located in the western part of city and still functions as a navy base and it is home to memorials. Right next to it, there is the USS Bowfin. Honolulu is one of those cities that provide every sort of shopping experience to its visitors. Do you want to shop some traditional items? You have market places to do that. Do you want to keep on the regular shopping? You can head to shopping malls that are filled with worldwide famous brands’ stores. International Market Place in Waikiki is a popular destination among the visitors since the majority enjoy spending time among the stalls that have traditional and authentic Hawaiian items. Aloha Tower Marketplace is one another place to buy souvenirs for your beloved ones. If you are in eastern part of Honolulu, then you can visit Kahala Mall and Koko Marina Center. You are going to come across a large number of restaurants and cafes serving the most exquisite dishes from the Hawaiian cuisine in Honolulu. No matter which part of the city you are in, it will not be hard for you to find a good quality restaurant. That is why that’d be better to know a bit about the Hawaiian dishes you’d like to try when you are in Honolulu. Honolulu is also famous for its splurge nightlife scene. There are clubs located alongside Waikiki Beach and most of them are open until 2 A.M in the morning. Kuhio Avenue is another district of the city that is filled with night clubs and bars. Even if you’d like to try some of the most exotic cokctails when in Honolulu, don’t forget to taste some of the local beers since they are worth a try. Liz's Pub, Mehana, Honu and Sam Choy’s are among the pubs that brew their on beer in Honolulu or have it brewed on the mainland and shipped it to the city. You will not be bored in Honolulu, this is for sure. However, if you want to do something outside of the city or something completely new for you, then you have got a large number of excursions to choose from. If you are a runner or enjoy running, don’t forget to bring your shoes with you because you are about to visit one of the most charming places that has the best weather for running. Especially Kapiolani Park and Ala Moana Beach Park great areas for your morning or afternoon run. Diamond Head is one of the most iconic landmarks in the city. This volcanic tuff cone makes the visitors see one of the most picturesque scenes ever. It is also a great place to exercise or for your daily workout. Honolulu is an ideal place to surf or try surfing for the first time. You are going to come across young Hawaiian people that are willing to teach you surfing. If you feel like you want something that doesn’t require so much energy, then see a show of “The Broadway of the Pacific” Diamond Head Theatre and Hawaii Theatre are the show venues you can check for a special artsy performance. Honolulu is one of the cities in the world that becomes the home of a large number of national and international events throughout the year. Academic congresses, conferences, symposiums as well with trade shows and fairs are held in the city. There are a large number of event venues to hold these sort of large scale events in Honolulu and all these are equipped with high technology in order to meet the attendees’ needs. When the exotic beauty of Honolulu is also taken into consideration, the city becomes even more suitable for world’s event tourism.